German Chocolate Cake, three layers of sweet, rich chocolate cake, creamy coconut pecan filling and covered in a chocolate buttercream frosting. 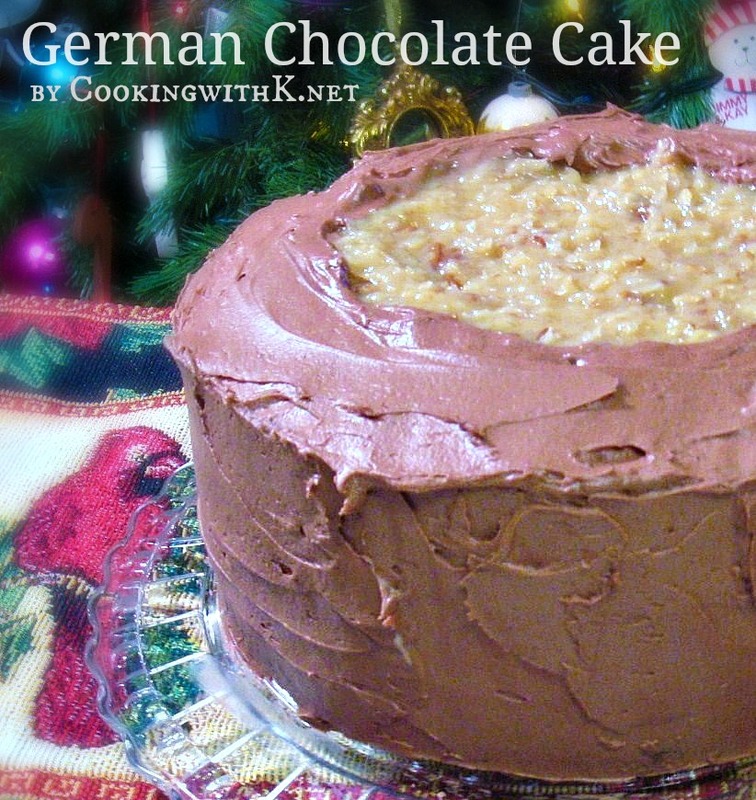 My all time favorite cake at Thanksgiving and Christmas is the classic German Chocolate Cake. 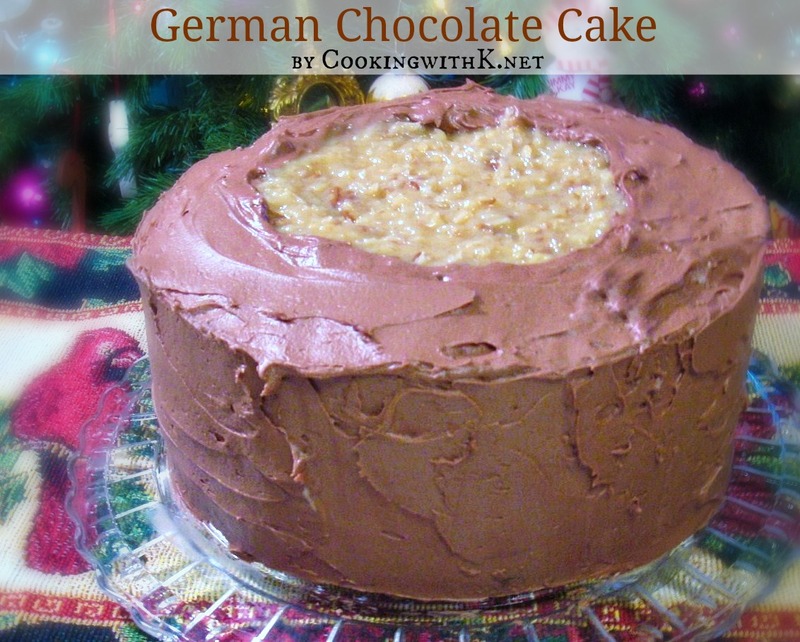 After reading about the origin of the German Chocolate Cake, it was interesting to know that the cake did not originate in Germany. The chocolate itself was founded by Samuel German in 1852, hence the name of the chocolate. The first published recipe for German Chocolate Cake was in a Dallas newspaper in 1957 and came from a homemaker. 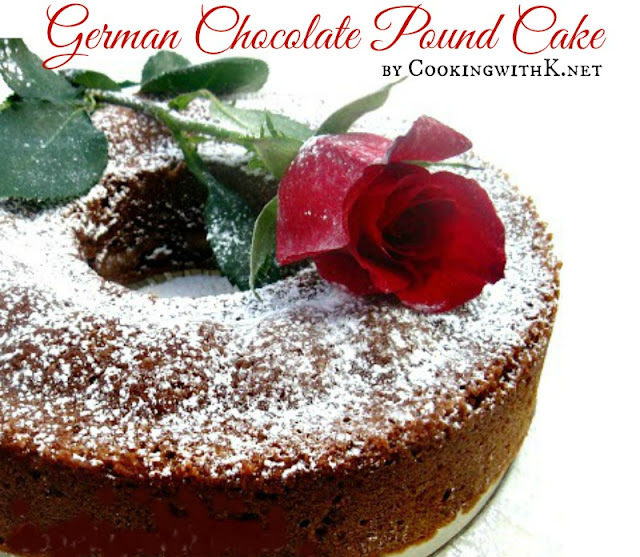 There are a lot of recipes for this cake with the most popular being the one on the box of Baker's German's Sweet Chocolate. While it is the recipe my Mother used, I began a few years ago trying to step out on my own to see if there were other recipes I would like better. On my venture, I did choose not to deviate from the gooey caramel flavored filling, laced with coconut and pecans, in between the layers, "that just couldn't happen". Some people like to frost the whole cake with this yummy filling, and I suppose that would be ok, but I grew with my Mother only putting it in between the layers and frosting the outside of the cake with chocolate frosting. Which brings me to the frosting - I did try an array of frosting recipes, from a Dark Chocolate Frosting, Milk Chocolate Frosting, and even an Espresso Chocolate Frosting, which I frosted my German Chocolate Cake with last year. I have concluded that my Mother's recipe is the best German Chocolate Cake, "Granny's Recipe" I have ever had. It was perfectly moist and full of flavor, not to mention a Perfect Chocolate Frosting that can't be beat! Beat egg yolks, milk and vanilla in large saucepan with whisk until well blended. Add coconut and nuts; mix well. Cool to desired spreading consistency; set aside. Heat oven to 350°F. Cover the bottoms of 3 (9-inch) round pans with waxed paper; spray sides with cooking spray. Microwave chocolate and water in medium microwaveable bowl on HIGH 1-1/2 to 2 min. or until chocolate is almost melted, stirring after 1 min. Stir until chocolate is completely melted; Set aside. Beat egg whites in the bowl of a mixer with the whisk on high speed until stiff peaks form; set aside. In a medium bowl, sift flour, baking soda and salt; set aside. Beat butter and sugar in bowl of a mixer with the paddle attachment until light and fluffy. Remove bowl from mixer and fold in egg whites with a rubber spatula until well blended, being careful not to break down the egg whites too much. Pour batter into prepared pans. Bake for 30 min. or until toothpick inserted in centers comes out clean. Immediately run small spatula around cakes in pans. Cool cakes in pans 15 min. ; remove from pans to wire racks. Cool completely. Sift together powdered sugar and cocoa powder; set aside. In a bowl of electric mixer using the whisk, on medium, cream together butter and 1 cup powdered sugar mixture until smooth and creamy. Add vanilla and half and half a tablespoon at a time with the remainder of the powdered sugar mixture. 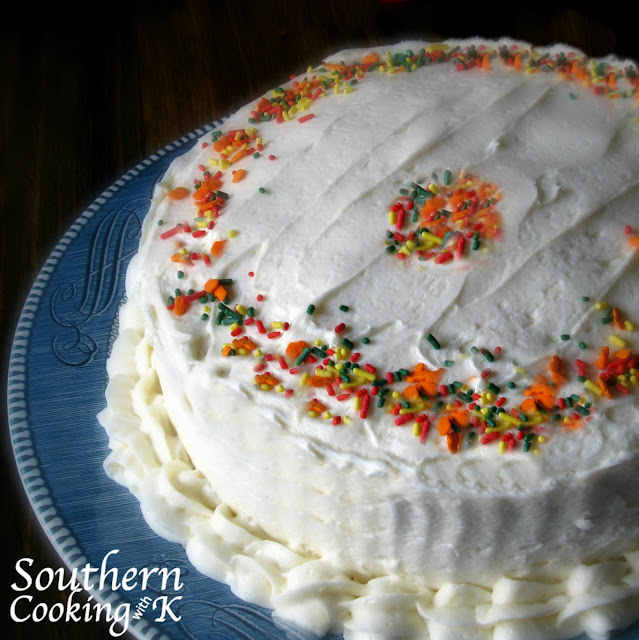 Add only enough milk to get the creamy texture for frosting a cake. What a beautiful cake! Love the cake, especially the coconut filing part! I love cake, but too difficult for me, but this recipe sounds so good. This is an olde but goodie...great recipe. Thank you for sharing and you have a great week! LOVE it!! Especially how you made the pool in the middle, lol! Spotted your magnificent cake on Holiday Haven's Christmas in July blog party. German Chocolate Cake is my husband's favorite! He has requested for the last 20 years as his birthday cake. This year he will get your recipe. Thanks! This looks lovely! Copied and saved the recipe. My family will love it. Thanks so much for adding this to the Christmas in July party! Oh, this looks delicious! I love the chocolate frosting. Thanks for sharing on Sweet Indulgences Sunday.